I’ve recently acquired a 1999 Mitsubishi Pajero Exceed form CardealPage. The experience in dealing with this company was just awesome!!! Transaction went really smooth! The person whom I was dealing with through the whole process was Osada. I should tell that I didn’t even expect that kind of attention from his side! He was going with me through every step; numerous e-mails, calls, quick responds to all my questions. Even when I collected the vehicle he phoned me again to make sure that everything is good and I satisfied with the purchase. Communication was just impeccable! For all you guys who have plans on bringing a vehicle from Japan (especially first-time buyers) I would strongly recommend using this company. The guys perform really well! No doubt – they are one of the best exporters of quality JDM used cars! From the time I ordered the vehicle till I pick it up – just a little over one month (which is really fast!!!). The company was truly honest about the condition of the vehicle: everything was described to their best knowledge (mechanically and cosmetically), lots of detailed pictures, etc….Upon collecting the Pajero the only thing which was wrong was a “dead” battery (which was expectable; boosted it up and no problems since then!) Drove it for a 1,000 km same day – zero issues! Love the vehicle! Would deal with them again! My best wishes to all staff at Cardealpage!!!! 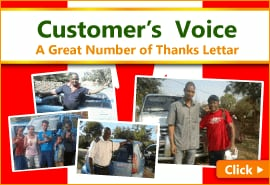 Thank you so much for your very kind words about our service and our vehicle. You just made my day! We take pride in our customer care, and I’m thrilled that you were satisfied with our vehicle and service from start to finish. We hope this will be only the start of a long and lasting business relationship. Our warmest wishes to you and your family! I am very satisfied with the experience of purchasing Mitsubishi Pajero Jr. from CardealPage. The personnel was honest, friendly, knowledgeable, and supportive throughout the deal. The vehicle was shipped right after the payment via the first available vessel and was in excellent condition just as I was informed. I strongly recommend this company to anyone who is considering to purchase Japanese pre-owned vehicles. 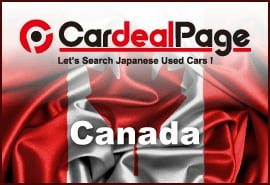 Thanks for your great work, the personnel of cardealpage.com. Thank you for using our service and sending us great photos and the feedback!! We know purchasing a car online from abroad is a huge shopping for our customers. Thus, the constant and clear communication is important to us. We wanted to remove all your concerns on the process of this purchase of your Pajero Jr.. Now we are happy to see the Pajero Jr. is in your hands safely. We are sure the car will serve you well! Have a wonderful day. I've bought 1997 Toyota Land Cruiser Prado from CardealPage and was really impressed by the condition of the vehicle and customer service from CardealPage. I received vehicle in the perfect condition, everything as described on the website. All electrical equipment works well. I was really impressed by the undercarriage condition, not a single rust spot underneath, looks like this car never seen snow in Japan. Tires were like brand new as well. I drove it 1000 km from Vancouver to Calgary without any issues. It took 1.5 months from the payment day to deliver vehicle to Canada which is fast, all shipping was arranged by CardealPage. My sales person was Yunus and he did a really good job. Yunus answered all my questions in 1-2 hours and sometimes just instantly. He provided me with updates so I know what a current state of the importing process is. I asked Yunus for specific Canadian documents and he prepared everything correctly and he sent me original documents by DHL. I got documents about a week before vessel arrived to Canada which is good. Overall, transaction went smooth, communication was excellent, and I definitely will use CardealPage again and will recommend this company to everyone who wants to get quality Japanese vehicle. Thank you so much for purchasing 1997 Toyota Land Cruiser Prado from us. It must have been a wonderful drive on the road through the Rocky Mountains in Canada! We were also glad to see you in the Japan office when you visited Japan. It is our confidence that we will provide the same constant communication and assist in the next purchase also. It was our pleasure to provide the service to you.